December 27th in Wordpress Plugins by Wordpress Jedi . Show widgets on specific posts: plugins such as Widget Context allow you to show or hide widgets on specific posts, pages, or sections. WP Widget Cache: some widgets could slow down your pages dramatically. Caching them could make your site more responsive. WP Widget Cache takes care of that for you. 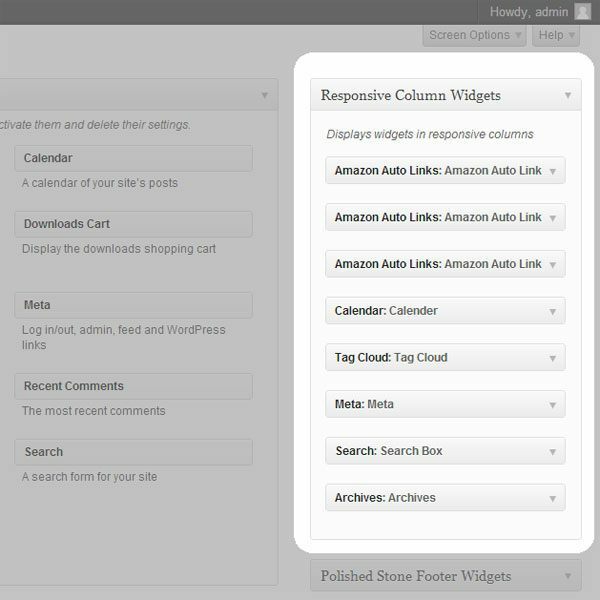 Make your widgets responsive: Responsive Column Widgets is a handy plugin that allows you to create a custom responsive column widget box. It arranges your widgets horizontally. Duplicate widgets: want to use the same widget in two different places? Duplicate Widget is just the plugin for the job. Lazy load your widgets: we have covered lazy loading here in the past a lot. Lazy Widget Loader happens to be a handy plugin that lazy loads your slow widgets to offer a better experience to your visitors. Gain more control over your widgets: some WordPress widgets have many limitations by default. Plugins such as Widget Reloaded allow you to do more with your widgets. It overwrites many of the default WordPress widgets. Use CSS to your advantage: it is no secret that you can customize your site with CSS. Widget CSS Classes allows you to add custom classes and ids to your widgets. Just makes your life easier. Build custom widgets: might sound difficult for newbies but plugins such as Widget Builder give you a lot of flexibility when you are trying to add custom widgets to your site. These plugins let you get more done with your widgets. I can’t think of anyone who wouldn’t find a few of these useful.